SuperSort and WordMaster were the first products sold by MicroPro International in September 1978. The company was formed by two employees of IMS Associates, a computer manufacturer which designed the IMSAI computer. When Seymour Rubenstein was director of marketing for IMS, he started developing an early version of a word processor for the IMSAI 8080 computer. He convinced Rob Barnaby, a genius software programmer, to also leave IMS and join him at MicroPro adventure. Barnaby wrote the first version of WordStar in September 1978. The program was entirely written in assembly language. Six months later, the commercial version was ready and first sales started in ComputerLand stores. WordStar was then the best selling software program of the early eighties. Paradoxically, one of the main reasons of its commercial success was that it has also been the most pirated software in the world for several years. Much more books and WordStar manuals were sold than the software itself. WordStar was designed to run on any CP/M machine. At the time, most of them used a serial video terminal as display device, with no editing and arrow keys. All the editing functions were thus performed through various combinations of Ctrl+letter keys. When the user got used to make the most of Control keys, typing and editing tasks were performed very quickly and WordStar was a very efficient tool. From 1978 to 1984, sales jumped from $100,000 to $70 million. Wordstar, CalcStar and DataStar (first office suite) were ported to CP/M86 and PC/MS-DOS. 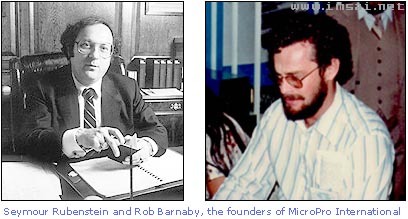 In 1984, Micropro was the largest software company in the USA. However, turnover curve started to reverse when several word processors were launched and began to compete with WordStar. Two of them will eventually supplant it, WordPerfect and later the first version of Microsoft Word. 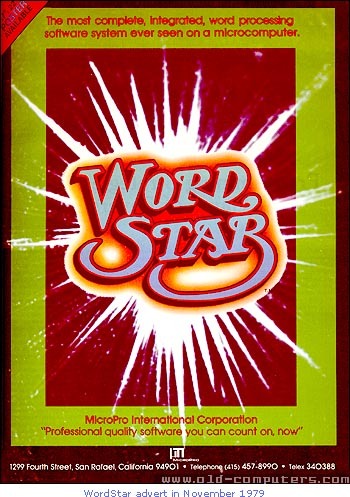 In 1985, Micropro released a new version called WordStar 2000, but it was rejected by users. WordStar source code was then sold to successive companies and the mythical word processor of the 80's sank gradually into oblivion.